Noko's flexible reporting lets you see the many hours you or your team has worked on. 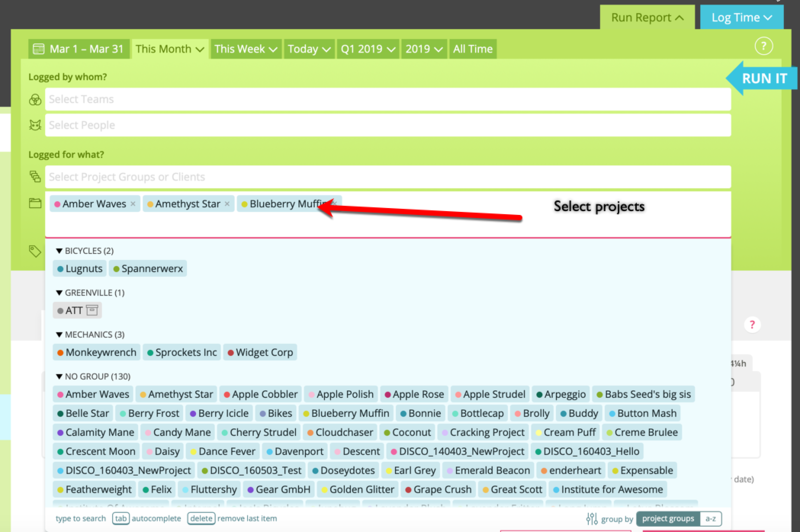 You can show each entry individually, group entries by time period, project, project group, people and invoicing status; as well quickly generate timesheets to check up on your team and the work that's being done. 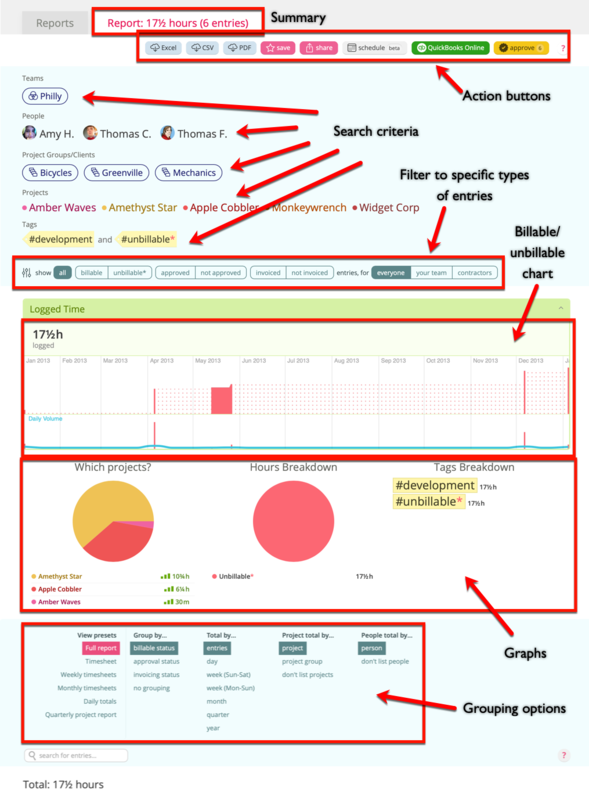 Plus you can dig deep into where time is going by filtering by tags and other criteria. The best thing—you can run a report from just about anywhere in your Noko account. Click the green tab on the top of your screen to show the Quick Reports box. The Quick Reports box allows you to customize your report so you can find exactly what you're looking for, while other report buttons in Noko will pre-set the report parameters. The green Reports tab is visible from every page in you Noko account. Even when you run a report through one of the many other green report buttons in Noko, you can open the Quick Reports box and see what parameters have been set for your report. What can I run a report on? You can select all time or be more specific and select a certain month or week, or you can pick completely custom dates for your report. To choose custom dates, first click the from date directly next to the calendar icon and set the from date, then click the to date (the second date in the calendar tab) to select the last day of your report. If you don't pick teams or people, Noko will run a report for all people in your Noko account. 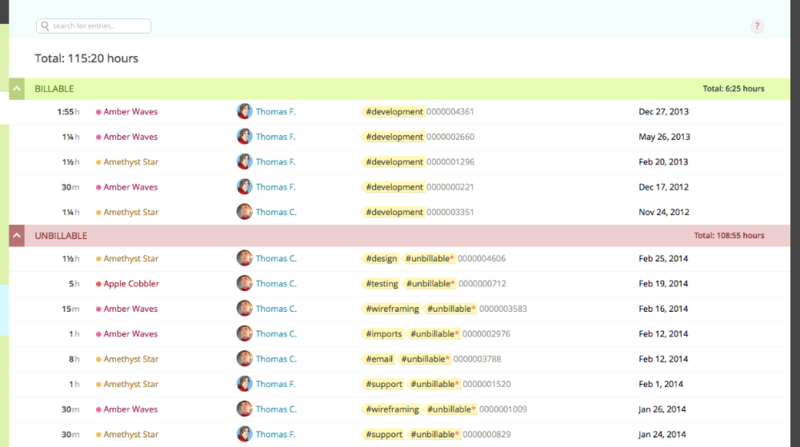 You can also select teams you want to run a report for and/or individual people. If you select both teams and people Noko will look for time logged by the people in the teams and by people you select manually. You can run a report on everything (just leave the fields empty), just one project, or on multiple projects. Choose a project group to run a report on and Noko will look for all projects in that client/group. Or even run a report on archived projects! You can pick any combination of projects. To generate a report that's more specific, you can define which TAGS to use. By adding tags you can narrow down your report or focus on certain aspects of your time. If you select more than one tag, Noko offers to either search for time logged with at least one of the tags includes, or if you want to be more specific, for entries that need to have all of the given tags. "At least one" means that the report will include any entries tagged with at least one of the tags you've chosen. "All" means that the report will only show entries with all of the tags you've chosen. Once you’ve narrowed down your report criteria click on the Run it button! With the action buttons on top of the report you can export the report as Excel, CSV or PDF, save and share the report and, if your account supports it and is configured for it, invoice the entries, export your time to QuickBooks Online or approve the entries.